Crystal Therapy is a pocket guide to the healing power of 88 crystals, complete with beautiful color photographs of each one. 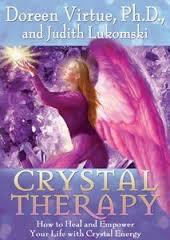 The book is suitable for beginners, and it focuses on crystals that are easily obtainable. Readers learn which crystal to use for particular health or life issues, receive clear explanations of crystal-related terms (such as phantom and record-keeper"), how to choose a crystal that''s been humanely mined, and read fascinating channeled messages from each crystal. The authors discuss how the crystals work with the angels and archangels; and outline the steps for laying particular crystals in your home to build energy grids that help with abundance, romance, a good night''s sleep, protection, and more. "